A man and his wife set off in their wagon to go to the market. On the way there the husband is very rude and impatient to everyone he comes across on the trip. During the trip, the man's wife tells her husband how much she would love to have some strawberries from the market but he tells her to stop complaining. At the market, the husband exchanges his fish for flour and his wife is very upset and doesn't talk to him on the way home. The next trip to market, the husband is friendly to everyone he meets and buys a big basket of strawberries for his wife. He thinks everyone else has changed, not himself. 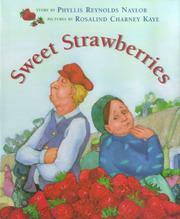 Naylor, Phyllis Reynolds, “Sweet strawberries,” Children's Picture Book Database at Miami University, accessed April 20, 2019, https://dlp.lib.miamioh.edu/picturebook/items/show/5967.